"someone et most of me already"
Being a toddler, Henry wants nothing to do with any of the good food that I make. He only likes the good food that the higher powers make, like blueberries or grapes. Even if he nods with great purpose when asked if he wants me to make him some toast, he will only take one or two bites. Maybe he is being literal and he just wants me to make him some toast; there was no eating of toast specified in my question, which I apparently have not reflected upon as carefully as he has. Pizza is still pretty safe. While we live closer than just about anyone on earth to the best pizza in the world, the line is formidable, so we get a lot of delivery or take a lot of walks to another neighborhood place. You can top with cheese and real sauce or pepperoni or whatever you like, obviously, who am I to tell you what to do? But I am stuck on this recipe, which used to be a recipe for fancy pizza with pancetta and fontina and caramelized onions and no tomato sauce, which sounds fancy and is good, but I’ve subbed and swapped and arrived at this version which I love, because that, dear readers, is how I roll. And yes, I prefer bacon to pancetta. While this is happening, put some crushed tomatoes or chopped tomatoes or whole peeled tomatoes that you will smush with a spoon a lot, into a small sauce pan. Sprinkle a bit of cinnamon in there. Simmer and add nothing else. Spread a bit of oil around the bottom of a baking sheet (the kind with tiny walls; I am afraid of the kind without tiny walls). Or at least, that’s what I used to do, before I threw out my filthy and warped tiny-walled baking sheet because I refused to move a baking sheet that was in such terrible condition. And now, Target only sells the scary flat kind. So without the proper pan, I look to the pizza stone, then clutch my head because it demands to be washed and completely dried before its first use, which would take a long time to wait for when one is already preheating the oven. Then, one must preheat the stone for hours and hours in the oven while one realizes that they don’t own a damn a pizza peel with which to use it. Pizza stone, if you worked for me, I would fire you for your inefficiencies. 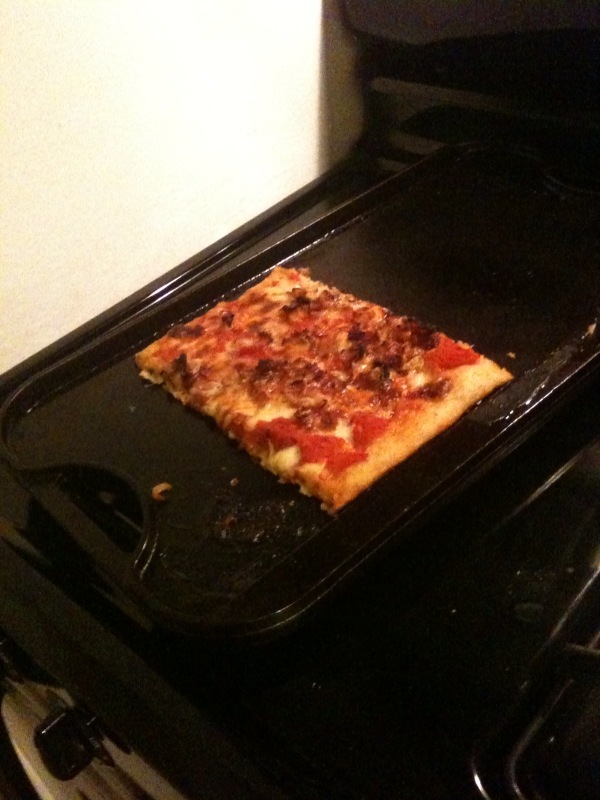 The last time I was moaning because I don’t have a new baking pan and I’d forgotten to wash and dry the stone in advance yet again, all while looking around for a way to fashion a stupid pizza peel out of a cardboard box, my husband first suggested takeout, but then he came up with a brilliant idea, one he would just barely live to regret. How about the cast-iron griddle? And I could just tell that it would make a brilliant, delicious, never-to-be-forgotten pizza. The cast-iron griddle was a genius present from my sister in law and her partner. It covers two burners and it large enough to make a protein, vegetable, and starch on it all at the same time, should you choose to griddlify your whole dinner in different portions as I did the other day with asparagus, polenta rounds, and shrimp with garlic, oregano, chili pepper, and cilantro. It’s wicked heavy, I think 17 pounds, but cast iron conducts heat brilliantly — better, I’m sure, than the fake rock purporting to be a pizza stone. I oiled the flat side of the griddle and stretched the dough out onto it, in an oval or a rectangle shape. I had to stretch it many times because it just skates back to the center on the oiled surface, but this isn’t specific to the griddle, it would do that on any oiled pan. I ladled some sauce on, if you can call tomatoes made slightly less harsh by cinnamon sauce, then added some mozzarella, then the bacon and onions. Cooked for 20 minutes. If you are like us, the smoke alarm will go off at least once. The flip side to me flipping out about the pizza stone is Matthew flipping out when it is time to remove a 20 pound 450 degree object from a scalding oven. This week was the second time we had done this. Based on the level of swearing — 8 out of a scale of 10 — I cannot in good conscience recommend the cast iron griddle as a pizza pan. However, the pizza certainly is is extremely delicious and rewarding. Perhaps I will look for a somewhat thinner and lighter cast iron thing to cook pizzas on. Oh! I just found one online that only weighs 11 lbs. Maybe I will reconsider my standoff with the stone.